Home / Drugs & Supplements / How do pain relievers work? This post describes all major kinds of pain relievers (e.g. pain killers or analgesics as they are sometimes called), including their mechanisms of action, health benefits and side effects. The word pain shares its linguistic origin with words punishment and penalty. Pain is a universally comprehended signal of disease and leads towards and indicates diseased area. It brings a patient to attention of a physician. Everyone experiences pain at one point or another. Certainly nobody among us is stranger to the occasional headache. Even a mild disease brings pain along with it. Our bodies can only bear pain up to a specific limit known as threshold of pain. Once this threshold is crossed, pain turns into agony and becomes unbearable. Pain brings with it depression and it reduces work productivity of a patient if it persists for long. Pain killers are drugs or medicines used to achieve relief from pain. In medical jargon, they are also referred to as analgesics. Pain has a crippling effect and can impair our physical and mental faculties while it lasts. Pain killers provide a much welcome solace from body aches of all kinds. They are anti pyretic. They reduce fever while battling pain. They interfere with action of fever causing hormone like substances, prostaglandins which cause body temperature to rise. They are anti inflammatory when taken in high doses. They reduce swelling. They do not cause sluggishness or stupor. They are not narcotic so risk of a user developing addiction for them is unlikely. Enzymes are protein based molecules that trigger specific chemical processes in our body. They convert reactants into products and are crucial for normal functioning of body processes. Many drugs achieve desired results by modifying action or production of enzymes. NSAIDs act by interfering with activityof cyclooxygenase enzymes. COX enzymes catalyze production of prostaglandins. Prostaglandins are chemical substances akin to hormones and one of their many actions is to act as messengers in process of inflammation. They also cause fever. NSAIDs stop the cyclooxygenase enzymes from carrying out production of prostaglandins and hence pain caused by fever and inflammation is reduced. Salicylates: Salicylates are salts or esters of salicylic acid and are main ingredient of aspirin. Salicylates are used to treat mild to moderate pain. High doses are extremely effective in cure of arthritis. Salicylate poisoning results from over dosage and symptoms include headache, dizziness and deafness. Naproxen: Naproxen is non selective cyclooxygenase enzyme inhibitor and is a propionic acid derivative. Acetic acid derivatives: For example diclofenac, indomethacin and tolmetin. Diclofenac: Diclofenac is a painkiller used to treat mild to moderate analgesia. It is particularly useful in treatment of pain caused by osteoarthritis or rheumatoid arthritis. It is useful in treating a number of inflammatory disorders such as musculoskeletal complaints, TMJ pain and gout attacks. Catafalam brand of this drug is used to treat menstrual cramps. Oral powder preparation of this drug known as Cambia is used to treat migraine. It elevates risk of cardiovascular problems and myocardial infarction. Patients with history of cardiac disease should avoid using this pain killer and opt for aspirin instead. Gastrointestinal ulceration and bleeding are a common side effect. Patients using this pain killer over a long term are advised to take a gastroprotective medicine along with it. Mental side effects are also observed in some diclofenac users. These include anxiety, depression, nightmares and psychotic reactions. Diclofenac can cause infertility in women, especially those who use it for a long period of time. Sometimes bone marrow depression is also noted (leucopenia, aplastic anemia, thrombopenia). These medical conditions can prove to be fatal if they remain undetected too long. Enolic acid derivates: For example piroxicam, meloxicam, tenoxicam. Fenamates: These drugs are derivatives of fenamic acid. Common examples are mefenamic acid, flufenamic acid, etc. Selective COX-2 inhibitors: COX-2 inhibitors are a sub group of non steroidal anti inflammatory drugs. Their action is selective for COX-2 enzymes and they do not affect COX-1 enzymes which produce prostaglandins protecting stomach mucosa. Hence, this sub group of pain relievers does not cause gastric ulcers and irritation. Some studies have shown them to be useful in treatment of cancer. Examples of this class of drugs are etoricoxib and celecoxib. Celecoxib: Celecoxib is a widely used selective COX-2 inhibitor. It is efficient in treating pain caused by inflammatory disorders and menstrual cramps. Its side effects include increase in incidence of cardiovascular disease which include myocardial infarction and strokes. Almost 80 % rise in incidence of gastrointestinal complications takes place. It can induce allergic reaction in patient because it contains sulfonamide. This pain killer can be found by trade names of Celebrex and Celebra for arthritis and Onsenal for polyps. Sulfonanilides: Systemic preparations of this drug are banned by many countries due to risk of liver damage. As mentioned before, NSAIDs inhibit action of cyclooxygenase enzymes. COX-1 through production of prostaglandins protects internal lining of stomach to prevent it from being eroded by its own digestive acids. When a non selective NSAID such as aspirin is used, protective shield of stomach mucosa is compromised due to low prostaglandin production and ulcers of the stomach and duodenum may result. NSAIDs further damage and irritate stomach mucosa because of their acidic nature. Vomiting, nausea, diarrhea and reduced appetite may result due to adverse effects of NSAIDs on gastrointestinal tract. NSAIDs apart from aspirin, elevate the risk of heart disease and myocardial infarction. Reye syndrome is a serious disease that affects children belonging to age group of 4-12 years (6). The patient suffers from brain swelling and liver damage. It usually occurs after a viral disease and is associated with use of aspirin. Extreme symptoms of this disease manifest in form of hyperventilation, seizures and coma and may eventually result in death of the child. Experts have been unable to find a definitive link between aspirin and Reye syndrome. The reason behind these renal side effects is change in renal haemodynamics (kidney blood flow), normally mediated by prostaglandins. They regulate and maintain normal glomerular perfusion and glomerular perfusion rate. NSAIDs block normal perfusion. If the situation aggravates, renal failure may take place. In some cases NSAIDs also may cause swelling of arms and legs due to retention of fluid from kidneys. COX-2 inhibitor and conventional NSAIDs do not mesh well and must not be taken together. People on aspirin therapy to benefit from its cardioprotective effects must exercise caution too while using NSAIDs as they may inhibit its cardioprotective influence. NSAIDs given to women during pregnancy may breach the placental barrier and may cause adverse effects on fetus and neonatal development. There is a danger of increase in risks of miscarriage and malformations. NSAIDs inhibit production of prostaglandins which leads to blocking of ductus arteriosus, the vessel that shunts blood past the lungs in the fetus. This causes pulmonary hypertension. These drugs have a prolonged half life after crossing placenta and must be avoided, especially during third trimester of pregnancy. Asthma may be aggravated in patients who use NSAIDs because they cause hypersensitivity. That is why asthma patients must not take NSAIDs without doctor’s recommendation. People using NSAIDs for long term may suffer from erectile dysfunction or find it harder to conceive. Studies have shown that men using NSAIDs exposed themselves to greater risk of erectile dysfunction. Taking NSAIDs as pain killers may lead to a variety of allergic reactions including formation of hives, swelling and wheezing. Inflammatory bowel disease such as Crohn’s disease manifests itself in form of abdominal pain, diarrhea and fever. NSAIDs aggravate this disease by causing gastric bleeding and irritation. Paracetamol and codeine are safer choices in this case. Photo sensitivity (sensitivity to light) is a common complaint among NSAIDs users. Benoxaprofen, diclofenac and piroxicam are the most photoactive NSAIDs. NSAIDs decrease renal blood flow and thereby lower the efficacy of dieuretics. NSAIDs may cause hypocoagulability. Things may take a serious turn an NSAID when combined with other drugs such as warfarin that also reduce blood clotting. NSAIDs may interfere and lower efficiency of SSRI anti depressants. Orally as they are easily available in tablet, capsule or liquid form. Topically. They are available as cream and gels. This mild analgesic is a necessary component of everyone’s medicine cabinet at home. It has widespread use as an over the counter pain reliever and anti pyretic. In comparison to aspirin, another mild analgesic, paracetamol does not cause gastric irritation. Calpol: This is a paracetamol suspension sold for children. It has a sweet taste. It is used for treatment of fever and pain. Panadol: Panadol is GlaxoSmithKline’s trade name for paracetamol in tablet form. These tablets are ingested with water or by dissolving in water. Panadol Extra is a combination of caffeine and paracetamol. Tylenol: Tylenol is an American brand of paracetamol used for relieving pain, reducing fever and for treating flu and cold. Paracetamol or acetaminophen has mode of action similar to that of NSAIDs as it also inhibits biosynthesis of prostaglandins in our body by blocking activity of COX-2 enzyme and exerts it anti pyretic and analgesic effect. It is highly selective for this enzyme. But compared to NSAIDs it has a very low anti inflammatory action and is not effective in gout or arthritis. It is regarded as ideal for use during pregnancy and nursing infants. However, in these circumstances it should still be used only following a prior consent of your doctor! Heavy overdoses of paracetamol may potentially cause hepatotoxicity. Hepatotoxicity means liver damage caused by chemicals. Paracetamol toxicity is a leading cause of liver damage and may be fatal. Alcoholics are more vulnerable to hepatotoxicity caused by paracetamol. Paracetamol toxicity is foremost factor of acute liver failure in Western world. Studies have shown that acetimanophen which is active ingredient of paracetamol, may cause severe biliary pain and cholestasis due to inhibition of prostaglandins. Cholestasis is a disorder of GIT where flow of bile from liver to duodenum is blocked. This is a disease in which there is platelet deficiency in patient’s blood. This causes bleeding into the tissues and bruising. Blood clotting is slow after injury. Acute thrombocytopenia has been observed as having been caused by sensitivity to acetaminophen glucuronide, the major product of metabolism of paracetamol in body. In individual allergic to acetimanophen, paracetamol use may trigger hypersensitivity reaction resulting in swelling and eruption of hives. If these symptoms appear, patient must be rushed to emergency room immediately. Several studies show that use of paracetamol by individuals prone to asthma increases risk of a wheezing episode or asthma attack (8). This has especially been observed in children and infants. Medical experts have however not been able to establish scientific explanation of this observation. Paracetamol is a widely used drug because it is cost effective and easily available. But it can be toxic in heavy doses. Besides liver damage, paracetamol is leading culprit behind poisoning worldwide. Paracetamol toxicity is treated with activated charcoal. If medical treatment is not sought, serious consequences can occur including cerebral edema, hepatic failure, kidney failure and hypoglycemia. The degree of severity of paracetamol toxicity depends on dose. While paracetamol is the analgesic of choice during pregnancy to treat fever and pain, doctors recommend to take it for shortest time possible. A research conducted by University of Edinburg students showed that constant use of paracetamol for seven days interrupted the production of testosterone. Thus it could affect the reproductive health of male fetuses. (10) Use of paracetamol by mother during pregnancy increases risk of childhood asthma in baby. Individuals with history of renal disease. Paracetamol, being a popular analgesic, is available in many forms. Opioids are synthetic narcotics. They are used to provide comfort to patients experiencing pain. Sensation and perception of pain is decreased. Reaction to pain is lowered. Threshold of pain is raised and tolerance is increased. They are sedative. They cause drowsiness in patient. It is dangerous to drive after using these analgesics. They can cause addiction in regular users. Common examples of opoids are oxycodone, hydrocodone, methadone, etc. These are opioids that are produced inside body. They include endorphins, enkephalins, dynorphins and endomorphins. These include morphine, codeine, thebaine and oripavine. Morphine: Morphine is sold under various trade names and it acts directly on the central nervous system to exert its analgesic influence. It is used to treat both chronic and acute pain. It is also used as a pain killer during myocardial infarction and labor. It can be administered via many routes; orally, intramuscularly, subcutaneously, subcutaneously or rectally. It has a high risk for addiction and abuse. If its dosage is reduced after long term use, withdrawl may occur. Common side effects include sedation, drowsiness, vomiting and low blood pressure. Codeine: Codeine is an opiate used to treat pain and to suppress cough. It is an important ingredient of many cough syrups. Like other opioids, it can induce physical dependence. Withdrawl symptoms include : runny nose, sweating, insomnia stomach cramps, nausea and vomiting. Codeine is used to treat moderate pain. These include diacetyl morphine, desomorphine, nicomorphine, etc. These include dihydrocodeine and ethylmorphine. This group includes buprenorphine, etorphine, oxycodone, etc. Tramadol, present in medical stores as Ultram is not a typical opioid. It is used to treat pain ranging from mild to severe. When taken orally, it brings about relief from pain within an hour. It exerts its action as a pain killer by two mechanisms. First, by binding to μ-opioid receptor. Secondly, it inhibits re uptake of serotonin and nor epinephrine. Common side effects particular to this drug are nausea, dizziness, dry mouth , vertigo, constipation , drowsiness and headache. Serious adverse effects include seizures, risk of serotonin syndrome (fatal drug interaction) and drug addiction. Because of possibility of inducing seizures and convulsions, it is very dangerous to be used recreationally and in heavy doses. μ-opioid receptors (MOR): These receptors are found in nervous system. Some are also located in intestinal tract. Activation of μ- receptor by morphine causes analgesia, sedation, itching and nausea. κ-opioid receptor (KOR): KOR is one of three main receptors that bind opioids in brain and bring about pain altering effects. KORs are extensively distributed in our nervous system. On activation, they exert analgesic action along with side effects such as hallucinations or dysphoria (unease). δ-opioid receptor (DOR): Also known as delta opioid receptor, activation of delta receptor produces analgesic effect much more significant than that of MORs. Several delta receptors may cause seizures when high doses of opioid pain killers are consumed. The pharmacological action of an opioid pain reliever depends on receptor to which it binds. Every group of opioid receptors triggers a specific set of neurological responses. Morphine has remarkably high affinity for MORs than other groups of receptors. Opioids are considered a cornerstone in management of acute pain emergency wards of hospitals . Opioids are also used to treat post operative pain. But patients must be tested for opioid tolerance before surgery to prevent any risks and dangerous side effects. Patients taking opioids for more than two weeks may counter tolerance to effects of postoperative opioids, leading to unrelieved pain or opioid withdrawl. Post operative opioids can be administered orally, epidurally or parenterally. Use of opioids for treatment of chronic pain is under extensive debate due to their addictive nature. Chronic pain is a significant public health problem and proves very frustrating for patients, especially elderly people. Studies have shown that opioids cause serious risks when used long term therefore they should be used with caution in non cancer chronic pain for example headaches, back pain, muscular pain, etc. Opioids are being used more often in pain management of non malignant chronic pain. Unpleasant sensation of nausea is a side effect of using opioid pain killers. Tolerance to nausea develops in 7-9 days of use. Vomiting is caused by gastric stasis and by direct action on trigger zone of the vomiting centre of brain, area postrema. Vomiting can be cured by prokinetic agents such as domperidone or metoclopramide. In many entertainment magazines, you surely must have come across high profile scandals or rehab stints of celebrities who were addicted to prescription drugs. Drug addiction is a complex set of behavior associated with misuse of drugs. It develops over time with consumption of increasingly high doses. Most opioid addicts inject opioid pain killers rather than ingesting them orally. People addicted to opioids compulsively seek out opioid pain relievers. This leads to disastrous consequences for their health, personal and professional life. Opioids are brilliant pain killers but they create a feeling of euphoria which makes them attractive to addicts. After using opioid pain killers for a considerable while, you might observe that you need more and more amount of dosage to relieve pain. This is called as developing tolerance to a drug. Physical dependence on a drug is the adaptation of body to presence of certain substance, in this case, opioid pain killers. It is characterized by the appearance of withdrawl symptoms when medication is discontinued. Opioid dependence usually results when patients administer self medication. It requires long term treatment and extensive care to treat. The treatment of opioid dependence is crucial for mental, physical and social well being of patient. The main aims of rehabilitation and treatment of patients dependent on opioid pain relievers are to reduce dependence on illicit drugs and to counter the morbid effects caused by over use of opioids. Breathing problems and respiratory depression is one of the most serious adverse reactions connected to opioid pain relievers. It is usually observed when a single, intravenous dose is administered to a patient whose body is not adapted to use of opioids. The regulation of breathing by body gets blunted. The way to counter this risk is first administer a very small dose of medication to an opioid naïve patient and then gradually increase dosage. Cognitive changes for the worse can occur in patients taking opioid pain relievers because they act on nervous system. The patient feels less sharp and thinking process is slowed down. It slows co ordination and causes confusion. The patient is usually muddled. An important side effect of using opioid drugs is that they are sedative and cause drowsiness. Tolerance to drowsiness commonly develops over a week but if it persists changing opioid drug may help. Fentanyl, morphine and diamorphine (heroin) are particularly sedative.The patient becomes sluggish and lethargic. This affects work productivity and may especially disrupt professional life of patient. Constipation is a common problem among people who take opioid pain killers. It develops in 90-95% of people particularly those taking opioid medications long term. Almost all opioid drugs cause constipation. This happens because these drugs affect receptors which are also present in gut and intestinal tract. Tolerance to this problem does not develop readily so in severe cases patient is recommended to take laxatives and stool softeners. Drinking lots of water and food with high fibre content also helps. 2-10% of people using opioid pain killers experience itching all over their body. It is not only bothersome but can also be quite embarrassing in social situations. Itchiness caused by opioid use is not an allergic reaction. This side effect is most pronounced when morphine is administered via an injection into the spine . If lowering dosage of medicine does not help, take an anti histamine. Dry mouth, clinically referred to as xerostomia is caused by change in composition of saliva or reduced salivary flow. Opioid medication for pain treatment leads to dry mouth as a side effect. Opioid induced hyperalgesia is a condition in which a patient using opioid pain killers developis elevated sensitivity to pain and his threshold of pain is lowered. Morphine, methadone, oxycodone and hydrocodone are especially mention worthy in this regard. Naloxone and naltrexone are effective in treating opioid over dosage! 90% of chronic or long term opioid users suffer hormonal imbalance. The occurrence and severity of hormonal imbalance is dose dependent. In females, this hormonal imbalance manifests itself in form of irregular menstruation. Medical and recreational use of opioids causes hypogonadism in both genders. Besides addiction, opioid dependence, these drugs also disrupt work because they are sedative. Workers who drive, control heavy machinery and vehicles are recommended not to use opioids especially for chronic pain. People addicted to opioid medication have increased chances of remaining unemployed. Because of their sedative and narcotic quality, opioid pain killers create increased risk of accidents especially when drivers controlling heavy vehicles use them. They also make user more accident prone because they induce confusion. If the patient has a history of drug addiction and drug abuse, he must be prescribed opioids with caution. Patients with chronic pain should not be prescribed opioid pain killers casually because long term use may cause hyperalgesia, addiction or drug dependence. Before administering opioid pain killers on patients who have undergone surgery, their medical history must be thoroughly examined. During pregnancy or breast feeding, use of opioids must be avoided, especially morphine, because they affect the baby. Flupirtine is a centrally acting, non opioid analgesic which is extremely effective in treating post operative pain. It is used in treating pain in conditions where there is no inflammation present. It does not have anti pyretic (fever reducing) characteristic. It is a non opioid drug. It is not an anti inflammatory drug. It is a non steroidal drug. It does not have any effect on fever. It is a non sedative medication. Flupirtine is a powerful analgesic which is a selective neuronal potassium channel opener. It is an NDMA (N-methyl aspartate) receptor antagonist . Its spectrum of action entails analgesia, muscular relaxation and neuroprotection. It exerts its muscle relaxant effect by inhibition of both mono and polysynaptic reflexes. The flexor reflex, brought about by NDMA receptor is suppressed by flupirtine. Programmed cell death, called apoptosis is caused by elevated intracellular calcium ion levels, cell membrane disruption and mitochondrial dysfunction and nucleolysis. Flupirtine reduces cell damage, ischemia, expression of oncogenes and thus decreases rate of apoptosis. In moderate to severe cases, it is used an analgesic to cure acute and chronic pain. Its muscle relaxant properties render it a popular choice to treat muscular cramps, back pain and various orthopedic uses. It is used to treat migraines. Flupirtine is used as pain killer for cancer patients. May be used in post operative pain killing scenarios. Fibromyalgia is heightened pain sensitivity, especially when pressure is applied. Medical researchers have found flupirtine promising in its treatment. To treat pain of tooth extraction. The most severe adverse effect of consumption of flupirtine is hepatotoxicity. It can cause serious liver damage is dose is not administered and controlled carefully according to doctor’s prescription. People with history of liver disease must avoid using these pain killers. Neuropathic pain originates due to damage or disease of somatosensory nervous system. Common manifestations of neuropathic pain are numbness, itching and pin point pain. But in more serious cases, there are paroxysmal stabbing pains which resemble electric shocks. It is commonly observed during spinal cord injury, multiple sclerosis and strokes. Neuropathic pain is frequently experienced by cancer patients due to damange of nerve cells or due to a tumor pressing against peripheral nerves. It is also directly triggered by chemotherapy. Anticonvulsants: For neuropathy caused by diabetes, pregabalin and gabapentin are drugs of choice. These anti convulsants are particulary helpful in treating neuralgia. Antidepressants: Serotonin-nor epinephrine re uptake inhibitors for instance duloxetine, venlafaxine and milnacipran are helpful in treating neuropathy. Botulinum toxin type A: Botulinum toxin type A is popular by its trade name, Botox. Intradermal injection of botox can alleviate chronic painful neuropathy. Cannibinoids: Cannabis and canniboid agents are quite helpful in treating neuropathic pain. Its side effects include central nervous system depression and damage to cardiovascular system. Tranquilizers are a special group of pain killers used to treat emotional pain or anxiety. People in a disturbed emotional state experience neurosis and have hallucinations. Tranquilizers are drugs used to fight depression, psychological pain and anxiety. Their nomenclature also denotes their tranquility inducing character. Schizophrenia: Antipsychotic treatment is a major key to treating schizophrenia. Treatment with antipsychotics reduces hallucinations and delusions. Bipolar disorder: Anti psychotics are often used in combination with mood stabilizers such as lithium or valproate. These tranquilizers are a first line treatment for manic episode associated with bipolar episodes. Barbiturates: These are central nervous system depressants. They produce a wide range of effects from sedation to anesthesia. They are also anti convulsants and decrease muscular pain. Paradoxical effects: Paradoxical reactions include increased seizures, epileptic fits , impulsivity and sometimes, suicidal tendencies. Cognitive effects: This drug brings along amnesia and short term consumption of benzodiazepenes adversely affects areas of cognition. Analgesics are quite often used in combination to enhance their pain relieving effects. For example paracetamol and codeine combination is used in many anti pyretic non prescription pain relievers. However, these combinations can trigger adverse effects. Besides accidental overdose, the unused components of these pain killers can react to produce toxic compounds. Cannaboids, drugs derived from the cannabis plant or manufactured, act as pain killers. Inhaled cannabis is efficient in treating pain resulting from spinal injury and multiple sclerosis. Other psychotropic agents include ketamine, clonidine , etc. Pain ladder is a term coined by World Health Organization to describe its guideline for the use of drugs in treatment of pain. Originally, it was used for treatment of cancer patients but now doctors extensively apply it for pain of all kinds. The WHO guidelines advise patients and medical professionals to begin treatment with a mild analgesic and progressively increase dosage as needed. 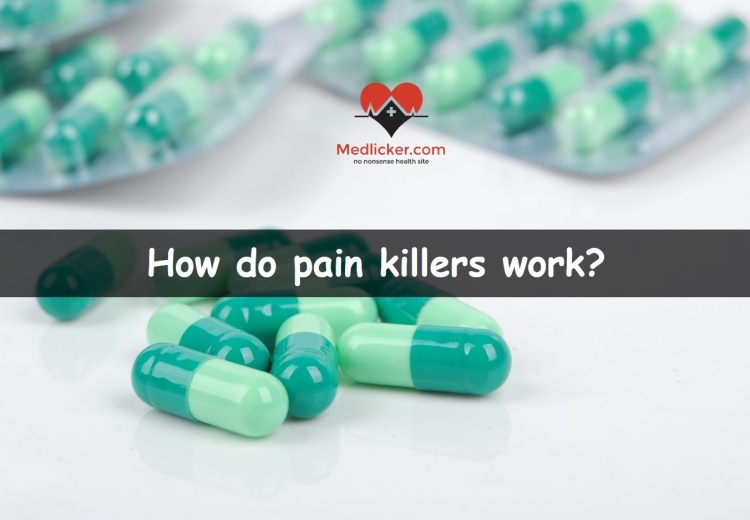 This article featured a detailed summary of most popular groups of pain killers. It was written for anyone, who wants to understand how pain killers work, what their main benefits and side effects are and what are some precautions related to their use. There is one thing you should bear in mind. Always ask your physician for consent and advice before attempting to take / buy any pain killers. Do not taky any without proper medical advice.